Little, Brown Books for Young Readers, 9780316478939, 256pp. 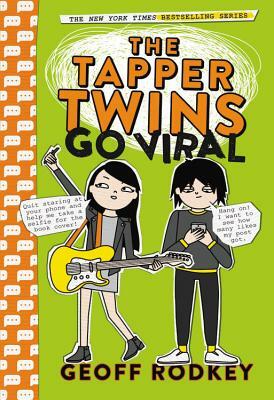 Told as a series of interviews, photos, texts, social media hits, and videogame screenshots, The Tapper Twins Go Viral is a laugh-a-page story about online fame and shame, with internet pro-tips and a serious lesson about digital citizenship. Claudia Tapper just doesn't get it: How is it possible that the video of the best breakup song she's ever written is watched by virtually nobody, when her brother Reese's completely moronic 2-second clip of an video game wipeout ends up being the hottest thing online at Culvert Prep? Unfortunately, Claudia's bold declaration of injustice sets the stage for the bet of her life: Which of the Tapper twins can get more online followers in a week? She had better top Reese's rapidly escalating popularity or she can kiss her social life goodbye if she loses the bet and is forced to post the most embarrassing video imaginable! Geoff Rodkey is an Emmy-nominated screenwriter who has written the hit films Daddy Day Care, RV, The Shaggy Dog, and the Disney Channel original TV movie Good Luck Charlie, It's Christmas. He is also the author of The Tapper Twins Go to War (With Each Other), The Tapper Twins Tear Up New York, and The Tapper Twins Run for President, as well as the middle grade trilogy The Chronicles of Egg. He lives in New York City.